In preparing for the wedding with the bride grooms specialattention is paid to the choice of location for the future of photography. To get an emotional photo, bright, beautiful, you should find a suitable place for its beauty, as well as take advantage of decorative props. Even a simple yard of the house, a forest or park can be decorated with delicate decoration, place it in an unusual scenery in the form of a swing, and then your wedding photo shoot will catchy and original. Swing - an indispensable attribute of every childchild. Why this attraction became so like newlyweds all over the world? They use it as a fun accessory for wedding photo shoots. 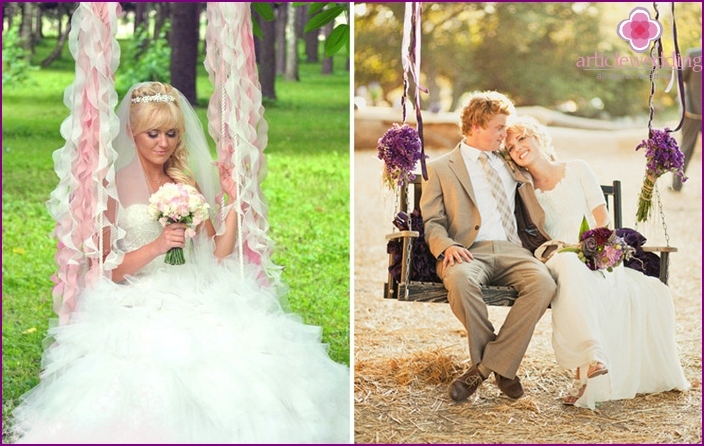 Through the use of a swing at a staged photo newlyweds can obtain interesting and unusual images. Use this attribute to create a fun, relaxed atmosphere during shooting. The bride and groom are in high spirits, whereby images are obtained filled with genuine emotions, feelings. Especially nice in the pictures look homemaderope swing. Make their own hands is not difficult, but on the decor, ornament will have to work. For a wedding in the spring and summer this accessory is traditionally decorated with flowers: live or artificial. Consult an experienced florist who will be original compositions of fresh flowers, pick up the plants, combined with the decor of all the wedding celebration. 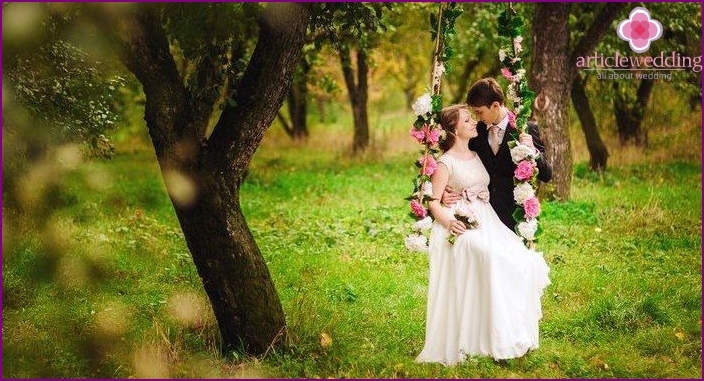 If you have a wedding planned exitceremony to the registration under the arch, it is desirable that the design and decorate swings the same colors that will complement each other beautifully and look at photos, videos. Bouquet of the bride and groom's boutonniere should be made in the same style with the other floral arrangements at the site of the shooting. In very hot weather, often haverenounce the use of fresh flowers for the benefit of the artificial. Under the scorching sun, live plants may wilt, lose appearance before the arrival of the newlyweds on the wedding photo shoot. From artificial flowers are small bouquets, compositions, which are then fixed to the twine or props to his seat. At least it looks nice swing, decoratedbright satin ribbons, cloth. If your wedding is sustained in certain colors, the decor tape is recommended to select the same colors. They are fixed on a rope, which is tied to the props, and to the seat. When driving, the belt will develop beautifully in the wind, that will give dynamic images. Another use for decoration fabric. Prettier just look translucent light materials when moving props hang beautifully. With the help of tissue not only decorate the design itself, but also to sew the little decorative pillows for seating. Successful is decoration, which combines several decorative elements: fabric, complete with ribbons of satin ribbons, artificial or fresh flowers. Live plants look nice and gentle onswing, decorated on the occasion of taking pictures in the wedding day. If you use fresh flowers, leaves not possible to come to the aid of artificial decorations. So, for a wedding in the cold season, florists and designers recommend decorating props artificial leaves. Branches of a blossoming luxuriantly green, though not genuine, bring in a photo shoot pictures winter brightness, originality. In addition to using the leaves budsartificial flowers, unnatural grapes, balls and other decorative elements. Independently make a beautiful composition for wedding shooting problematic. It is advisable to use the services of professional designers, decorators. They will even be able to turn ordinary village swing in a unique art object. If you have refined taste and lovedo needlework, you can make homemade swing and beautifully decorate them. But the lack of preparation time for props wedding photography is best left to professionals. Experienced designers know how to beautifully decorate attributes than to decorate them, what materials are used for this purpose. Your celebration is organized in the same style, it hasspecific thematic focus? So, all the details of the banquet hall, the room where will be held the wedding ceremony, reception and honeymoon photo shoot area, should be made taking into account the main themes of the holiday. 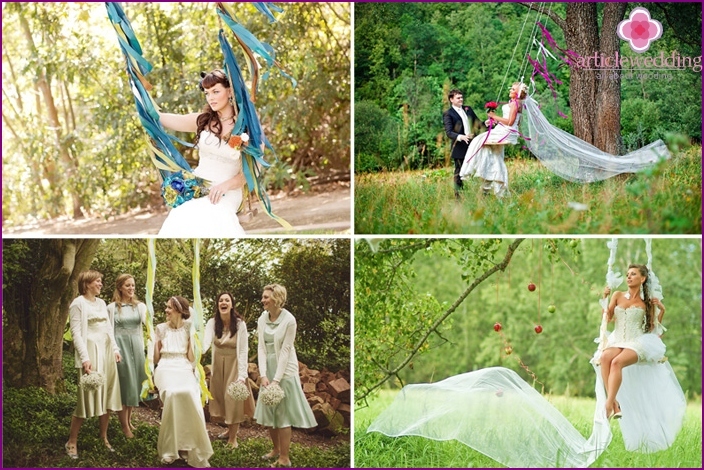 Design swing will be a real decoration of your wedding day shooting. In preparation for the wedding day think overnot only their clothes, the choice of the banquet hall, the details of the honeymoon, but props for photo shoots. Swing - the perfect symbol of joy and fun, qualities that must be captured in images in the most important day of your life. Complete construction of vivid detail, flowers, photos to come out unique and original. Take a seat on a wooden commemorative inscription scratched on her wedding date or initials of the newlyweds, and then this accessory will turn into an exclusive holiday decoration.